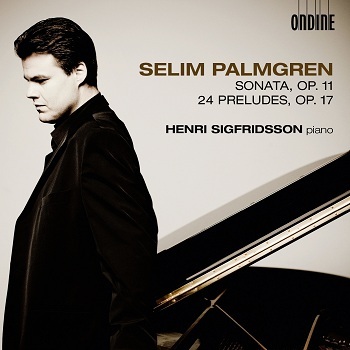 Selim Palmgren (1878-1951) is regarded as the most important post-romantic piano composer in Finland. The core of his output is formed by his five piano concertos and more than 300 small pieces for piano. Not for nothing was he dubbed the "Chopin of the North". The Sonata in D minor is Palmgren's most extensive work for piano and it was hailed as a milestone in Finnish music. The 24 preludes contain many of Palmgren's finest gems, covering a wide range of styles and expressions. Henri Sigfridsson (b. 1974), one of the major Finnish musical talents of his generations, has built up a successful international career, been winner of important competitions and performed at major concert venues and European music festivals, including Salzburg, Lucerne, Ruhr, Gstaad and Lockenhaus. Since April 2011 he is Professor at the Folkwang University of the Arts in Essen and thus holder of one of the highest positions in this field.